I have decided my next big project will be to present a narrative of my family history. I hope to fill in gaps of memories with documentation and truly illustrate the character of my ancestors. This first chapter serves as a brief introduction to my (1) purpose in publishing this series, (2) the background of the family line, and (3) methodology of my research. I studied history at my university and enjoyed presenting research at the Phi Alpha Theta Convention in 2014. However, I turned to the wild adventure of teaching middle school upon graduating. Now, I’ve transitioned again by taking up work in digital marketing. My hope is that I might use my collective professional experience to give a balanced record that is engaging and useful for reading to all peoples. Using my degree, I will provide accurate research. Then, my experience as a teacher and copywriter will supplement the content with emotions and spirit. Wisely interpreting history lends us many lessons. Often quoted is the age-old saying, “those who forget their past are condemned to repeat it.” While that application is useful, we should see history as more than just a tool for casting blame or justifying some government policy. History also gives us our identity. All of our cultures have evolved from and blends with the many stories of the past. Our entertainment, language, art, and literature are all shaped by the events and people that came before us. The family unit is the most basic foundation of a society. To understand your family is to understand yourself. And since we are all connected in some way, we, therefore, understand the world. Amidst the chaos of this fallen creation, we all could use some empathy and grace towards our one another. If we aren’t careful, family history pursuits could turn into a clannish quest to prove superiority. Beware. Idolizing bloodlines may breed unhealthy nationalism. We tend to paint every figure of history in broad strokes. Either they are the hero or villain of progress. Otherwise, they are unimportant bystanders. Life is usually not that simple. Instead of praising the good guys and scorning the evil doers, we ought to fairly study their character and motivations to understand the human psyche. Moreover, generally speaking, records only exist for the free and educated. The slave, oppressed, and indigenous peoples of the world often don’t have a voice through traditional written words, lacking journals, history books, and legal papers. We should demonstrate humility and cherish the diversity of storytelling in our world. Your identity might come through documents. Others find connections in dance, songs, quilts, recipes, crafts, and so forth. In the end, we are all one family and race. We all find connection together through God’s love and forgiveness. I am acutely aware of my own involvement in the narrative presented, a rare and unique experience for any historian. In addition to the available written evidence, I have personal memories of my grandparents. Some recollections are humorous, others somber. As selfish as it seems, I cannot help but see the story with myself as the conclusion. The actions and inactions of my ancestors directly affect my life today. Quite literally, the traits of their biology shapes me. Normally, the historian aspires to detach themselves from the emotions and stick to concrete facts. However, the tale I am about to tell is my own. Without emotion, it has no heart. My family tradition claims we are descendants of a John Pace of Middlesex County, Virginia from at least the 1670s. It’s disputed whether John is a direct descendant of Richard Pace, an original settler of Jamestown who famously warned the settlement of an Indian massacre. Documents from that era are extremely difficult to find and worse to interpret. Thankfully for me, the Pace line is well known with names of relative renown throughout early Illinois. Much of my family’s speculation has been easily confirmed by compiling census data. It’s also helpful that Paces and their spouses served in almost every war in American history, including the Revolution, War of 1812, Blackhawk War, both sides of the Civil War, and in the Philippines. I created this tree using Geni. While Ancestry has a nice tree it automatically generates as you build documents, it doesn’t have as many options to customize the display or embed it. I’ve also branched out some of my mother’s side and found there are Plummers just three generations back. I’d like to see how they might connect to the Plummers of Hiram’s family. But, I’ll handle my mother’s family in a separate record. This record will set forth the documentary evidence to support the above tree and enrich it with personal stories and anecdotes. And since we are now in the 21st Century, I also thought it wise to publish these chapters online in my blog or anywhere else. I hope there may be some distant relative reading from across the country that may find new revelation. I am indebted to my great-grandmother’s cousin Lyman Graydon Louis. In 1974, he sent a collection of research to Annabelle that covered from John Pace I to Granville Pace (d. 1893). It includes quotes from wills, letters, and court documents that I would never find online. Even if its mostly random factoids on land transfers and crop rotations, I wouldn’t know where to start without it. This mysterious red binder has sparked my curiosity since middle school. I wrote my first real research paper with the book as my primary source in 9th grade. Then I created a chart of it for a family history project in 11th grade. However, the book has always remained a scattering of unpublished notes with no link to my grandmother. Granville has no direct relation to me. My great-great-grandmother is mentioned towards the end but not referenced as such. I only knew Minnie’s relevance because of oral tradition. Now that I am more professionally acquainted with the historical craft and the art of language as it were, I thought it proper to create an updated binder for my family to have for generations to come. My main starting point has been the Lyman sourcebook, that he apparently titled “Pace Middlesex Line” and henceforth referenced as PML. The notes on the 1898 Pace Family Reunion in St. Louis represents a major shift in the narrative towards the modern era and proves pivotal in establishing connections. Lyman himself would have had extensive firsthand accounts of the event, given his grandfather, Hiram Plummer, attended. Using the people and dates listed in PML, I am searching through census data to create a timeline of how the family moved geographically. Using modern-day Google Maps, I can see the approximent roads and distances they would travel to work and school. The Paces started in Virginia around 1670, moved to Kentucky, and then Illinois by 1819. From that point, my branch of the family moved to St. Louis, Missouri around the turn of the 20th Century. More recently, my grandfather trained on the beaches of Florida before being shipped off to Europe for World War II. He came back and decided the weather was more agreeable than the upper Midwest. My immediate family has remained in the Sunshine State ever since. Using the military records of Ted and other ancestors, I can further trace the paths of their regiments and their exact roles in specific battles. Gravestones biographies and photos are also publicly available online through the Find a Grave network. Ancestry has a limited inventory depending on your payment plan. Unfortunately, I don’t expect to finish this project within the 8-day free trial. I’ll have to complete my research before the end of the 6-month subscription. Google Books has millions of digitized ebooks with primary sources from the eras with missing gaps from Lyman’s PML. I know several members of the Pace line were prominent in the Freemasons. The fraternity, while supposedly very secretive, has lodge roosters and bulletins publically available online dating back to the 1840s. I intend to fill this record with what personal memoirs and photos we may have on hand. Though I’ll do my best to find newspapers and histories of Jefferson County and the surrounding area for anecdotes. Secondary material is also good for “data mining” as one of my professors used to call it. I am returning to an old program I used in my university research called Zotero to collect and annotate my source material. I highly recommend it for any kind of research. With the program’s browser plugin, you just press a button and it captures all the bibliographic information from the web page and saves it to the standalone application. I only wish there was a phone app that linked to it so I could review my notes on the go. My plan is to release a detailed chapter for each figure in my direct line. Being that there are at least 10 generations I can trace, I should have around 10 chapters (or posts, if you’re reading online). Not sure how long this would take to really give it quality research and writing. 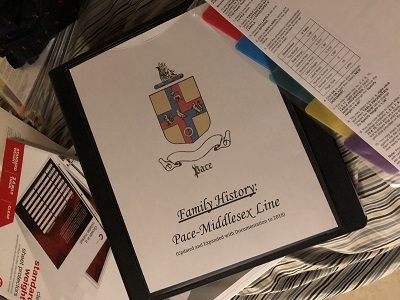 Just a crazy idea of mine: I could present this research to the Pace Society of America to gain admittance and access to their more established genealogical record. That means… I’d like to finish before the next Pace Family Reunion in Oklahoma City in June. I’d hate to abandon all other writing just to finish this project. I’d also probably go mad… Let’s hope that doesn’t happen. How do you connect with your family history? Are you from the Pace family? Maybe we can help each other out!